Our website carries a number of articles I’ve written on this topic over the years, and when I look them over now, I can clearly see that my understanding of certain details has become more finely tuned with the passing of time. I want to take this opportunity to discuss one of them. Back in November 2007, at the annual meeting of the Near East Archaeological Society, I gave my first public report about my Noah’s Ark research. An Armenian Perspective on the Search for Noah’s Ark reflected my thoughts on a number of aspects of the subject as they stood at that time. One of these was about the significance of the term “Baris.” I first encountered it in an article written by Bill Crouse, Noah’s Ark: Its Final Berth (off-site link). This article, still available on the Internet and later republished in expanded form in Bible and Spade (19.4, Fall 2006), introduced me to the case for Mount Cudi as the mountain of the Ark. Though my own pilgrimage of learning has since taken me in a different direction than brother Crouse, I greatly respect him for his many years of careful study of the historical evidence for Noah’s Ark. His skeptical view of the alleged eyewitnesses of the Ark on Mount Ararat has also made it far easier to identify the testimonies that should NOT be relied on for information. But in the end, my study has driven me to the conclusion that the various problems that bother Crouse and others, causing them to reject Mount Ararat as the Ark’s location, can in most cases be resolved. Josephus also quotes the work of Nicholas [also rendered Nicolaus] of Damascus, the friend and biographer of Herod the Great. Nicholas claimed that he put great labor into his historical studies and apparently had access to many resources. It is possible he was one of Josephus’ main sources. His story of the Flood, however, deviates from the Biblical account in that he has some surviving the Flood outside the Ark. His location for the final resting place of the Ark seems to be in harmony with the Gordyene site. He claims the Ark landed above Minyas on a great mountain in Armenia. According to ancient geographers, Minyas was a country slightly below and to the east of Armenia, below present-day Lake Urmia in Iran. The name he gives this mountain, “Baris,” is a mystery. According to Bailey, the Greek word baris means “height,” or “tower,” and can also mean “boat”! 23 [emphasis added]. Whenever I read someone’s analysis of a subject, in evaluating it I tend to key on the things which, to one degree or another, appear uncertain. In the above quote, the statement that Baris was a mystery got my attention. The footnote reference given, to Lloyd R. Bailey’s book Noah: The Person and the Story in History and Tradition, did not help clear up the identity of Baris. All it did was give possible Greek meanings for the word. Granted that Nicolaus wrote in Greek it was at least a start, but place names are often rather arbitrary, and have no intrinsic or descriptive connection with their object. One cannot demonstrate a clear connection of any object with a potentially arbitrary label. Despite this mystery, this unknown, Crouse stated that “His [Nicolaus of Damascus] location for the final resting place of the Ark seems to be in harmony with the Gordyene site.” When I read that statement I wondered, how can this Baris be in harmony with any site, if it is “a mystery”? I believe Crouse himself sensed this, because he stated it “seems to be” consistent with his chosen site for the Ark—Mount Cudi, in the range that in antiquity was known as the Gordyaean or Cordyaean Mountains, running in an east-west direction to the south of Turkey’s Lake Van, just north of the Tigris River. “Seems to be” was not exactly a ringing affirmation. Perhaps Crouse was trying to put the best possible face on this uncertainty. That is perfectly understandable; we all do it whenever we have a good deal of confidence in our Big Picture about something, yet cannot fit all of the details neatly into place. Hope springs eternal; we trust that with the passing of time, we will find a way to fit all the pieces of the puzzle together. But because I cannot bring myself to dismiss many of the testimonies claiming the Ark’s landing place was on Mount Ararat, this mystery was a challenge I embraced. It held within its very mysteriousness—its resistance to neatly fitting into the Mount Cudi historical tradition—the potential of providing evidence for the Mount Ararat location that would allow at least some of the alleged eyewitness testimonies to be accepted as true information. After all, if Mount Cudi is the correct site, every single one of the ostensible sightings on Mount Ararat—approximately 40 have been tabulated to date (off-site link)—is either an innocent mistake or a deliberate falsehood. There are no other options. Given the sheer number of reports and the several points many share in common, that was a tough one for me to swallow. In particular, the testimony of George Hagopian struck me as having the ring of truth about it, because he used the unambiguous name Masis, the Armenian term for Mount Ararat; included a lot of peripheral details that would not have bolstered his case with a skeptic, such as his claims to have climbed on top of the Ark and that its wood was petrified; had his background carefully checked out; and took a lie detector test. Being unable to suggest reasonable cause to dismiss it, his testimony was and remains an unfathomable mystery to those who advocate the Mount Cudi site. I initially had no clue from whence this image originated. What you see above is the picture exactly as it was shared with me: unattributed, cropped, and including a note equating Baris with Mount Ararat. Obviously SOMEONE thought Baris was Mount Ararat, but I hadn’t a clue who it was, or his reasons for thinking thus. This find confirmed that a reputable scholar had cause to think Mount Baris and Mount Ararat were one and the same. It remained to try to discover Shepherd’s reasons for thinking thus, identifying Baris with Mount Ararat rather than with Mount Cudi, further to the southwest. Discovering that after his death Shepherd willed his papers to Columbia University, I tracked down contact information for the research librarian there and asked if he knew about them. He wrote me back that yes, they had many of Shepherd’s papers in their library, but they were all boxed up and would have to be examined onsite. Further, not all of the material was catalogued, so there was no telling if the specific information I sought was there—namely, an explanation for Shepherd’s decision to locate Baris at the site of Mount Ararat. I deliberated for a while the advisability of spending a day pilfering through the materials with fellow ABR staffer Gordon Franz, who frequently takes advantage of living not far from New York City to do research at the wealth of university and public libraries there. But in the end I decided against it. I had no confidence that the time, expense and effort expended in traveling to New York and scrounging through dusty boxes would pay dividends, so I resigned myself to allowing the mystery to remain unsolved for the time being. According to Nicholas himself, Mount Baris is in Armenia, above the region of Minyas (i.e. the land of the Mannai). This description fits the area of Ayrarat [a province of old Armenia that included Mount Ararat]: here we find the “big mountain called Baris.” It is clear that this refers to the highest mountain of the referenced country, i.e. the Masis. Indeed, one of the various attributes with which the Armenians describe this mountain is bardsr (=high, height) which coincides with the meaning of bares (barez, height; barezant, high). From this we deduce that the Armenians’ neighbors knew the mountain only as Bardsr (Bares, Baris), the “high one,” which became known, most likely, through the Persians, for whom the name coincided with their divine mountain Hara-berezaiti, also called Bares. The principal indigenous name for the mountain, in contrast, did not catch on outside of Armenia. Even today the Masis is known by foreign peoples with different names: the Persians say “Kuhi-Nuh,” the Turks “Agher Dagh,” the Tatars “Dagher-Dagh,” the Europeans, erroneously, “Ararat” (Ararat und Masis, p. 49). To Murad, then, “baris” was simply a descriptive term for an otherwise unnamed high mountain. Only the Armenians used the name Masis; everyone else knew the peak descriptively as “the high one,” or used some name specific to their own country. The problem was, Josephus tells us that Nicolaus used Baris as a proper name for the peak, throwing doubt on its being purely descriptive. (It would be like calling a dog a “curly-haired yippy” rather than a “poodle.”) I found Murad more helpful in tying “baris” to Mount Ararat than Bailey, but questions still remained—it appeared Murad was resorting to a lot of conjecture. The mystery was not yet cleared up. It is impressive to this researcher, that Josephus seems to indicate there is a consensus among the historians of his day, not only about the remains of the Ark still existing, but also concerning the location. I fully agree, except for the trifling point that Berossus was not a historian of Josephus’ day, having died several centuries earlier. At any rate, by offering up multiple authorities concerning the Ark’s location in Antiquities 1:3:6—Berossus, Hieronymus the Egyptian, Mnaseas and Nicolaus of Damascus—Josephus was obviously trying to strengthen his case via mutually corroborating information from different sources. The works of Hieronymus the Egyptian and Mnaseas are essentially lost, so we can only examine Berossus and Nicolaus. It is time for a little background before we continue. Wikipedia advises us that Berossus was a Babylonian writer, a Chaldean, a priest of Bel (i.e., of Mar­duk), and a contemporary of Alexander the Great, possibly born during Alexander’s reign over Babylon (330–323 BC). He wrote in Greek—his major work being the Babyloniaca, a history of Babylon—and for the latter project had the patronage of the Macedonian/Seleucid king, Antiochus I Soter (281–261 BC), so he died some time after 281 BC. Wikipedia also notes, “Pure history writing per se was not a Babylonian concern, and Josephus testifies to Berossus’ reputation as an astrologer.” This, together with the pressure to create a politically correct presentation of Babylonian history meeting the approval of his patron Antiochus, gives us reason for concern about his reliability as a source of true history. The antiquity of his information encourages many to overlook that flaw, however. As for Nicolaus of Damascus, his Wikipedia entry suggests he was born in 64 BC. We know him principally for his biography of Herod the Great. He wrote in Greek, but it is apparent he drew from sources written in other languages. His great claim to fame is his massive Universal History in 144 books, only fragments of which still exist. The citation made by Josephus is from this work. Now all the writers of barbarian histories make mention of this flood, and of this ark; among whom is Berosus the Chaldean. For when he is describing the circumstances of the flood, he goes on thus: “It is said there is still some part of this ship in Armenia, at the mountain of the Cordyaeans [Gordyaeans]; and that some people carry off pieces of the bitumen, which they take away, and use chiefly as amulets for the averting of mischiefs” [emphasis added]. Nicholas of Damascus, in his ninety-sixth book, has a particular narration about them, where he speaks thus: “There is a great mountain in Armenia, over Minyas, called Baris, upon which it is reported that many who fled at the time of the Deluge were saved; and that one who was carried in an ark came on shore upon the top of it...” [emphasis added]. This is the sort of problem that keeps a person up at night. Josephus’ quotation is probably the closest to Berossus that we have although whether he got it directly from Berossus or indirectly through Nicolaus we do not know. The other versions of the story are from a 9th century AD Greek summary [Syncellus] of Eusebius’ 4th century AD version (quotation? paraphrase?) of a 1st century BC abridgment of Berossus text [Polyhistor] and an Armenian translation of the same passage of Eusebius. In this situation, we can be certain of the general sense of the story but at the level of individual words we can’t be sure. My guess is that the plural is more likely to be correct [in the original Babyloniaca] since Josephus could have unconsciously or consciously been influenced by the Biblical story or Nicolaus or both when he wrote, but proof is not possible [emphasis added]. All we can say, then, is that it appears Berossus probably originally used “mountains,” but we cannot prove it. Regardless, the two points in common to the Berossus and Nicolaus versions as Josephus gives them are in agreement. For our purposes that is sufficient to indicate Josephus’ desire to give multiple points that did not conflict, but mutually corroborated one another. Hence, it is a mistake for us to pit them against each other. Josephus must intend for “the mountain of the Gordyaeans” to be the same as Baris, not a different location. Modified from www.azerbaijan.00page.com/manna.html (off-site link). In summary, we cannot equate “the mountain” in Josephus’ Berossus citation with Mount Nisir in the Gilgamesh Epic. If we respect Antiquities as a primary historical source, we should stay within its text and use Josephus’ citation of Nicolaus of Damascus, with its mention of Minyas and Baris, to establish where we should seek the mountain of the Ark. We now turn to the second piece of information Nicolaus provides. The phrase “of the Cordyaeans” in Berossus was apparently brought over from the Xisuthros myth, and does not tell us anything about the name of the mountain. Nicolaus, however, tells us plainly it was “Baris,” bringing us to the heart of the mystery. There has never been a “great mountain above Minyas” known by that name, in any language, at any time. Mount Ararat has been known by different names in different tongues, but Baris is not one of them. For example, the Persians knew it as Kuh-i-nuh, the “mountain of Noah.” (It is fair to wonder why, but we won’t go there today.) The native Armenians knew the mountain by the name Masis, a name not used by any other nations. “Masis” bears a superficial similarity to “Baris,” but is there any real connection? Crouse and Franz have never addressed this question in their research, so I plunged right in. This search for a relationship between “Masis” and “Baris” finally paid off. In April 2007 it led to a real breakthrough in resolving the Baris mystery, for which I give God all the credit. Sensing that I could gain some clarity using information from Armenian sources, I got in contact with Thomas J. Samuelian, now a lawyer in Armenia. He had obtained a PhD in linguistics from the University of Pennsylvania and taught briefly at Penn as Assistant Director of the Center for Soviet and Eastern European Studies, as well as at Columbia University and St. Nersess Seminary. From JSTOR I discovered he had written an excellent overview of the case for the Armenian Highlands being the cradle of human civilization, referencing linguistics studies to show the likelihood that the Indo-European peoples took their rise in this area. That paper, Armenian Origins: An Overview of Ancient and Modern Sources and Theories, 2nd ed (off-site link). opened the door for me to get in email contact with him. It is significant that no mountain in the Armenian Highlands has been known by the name of Baris. Such a significant mountain name would not have been forgotten completely, therefore it is logical to assume that it was corrupted before the time of Nicholas of Damascus. When and how could such a corruption take place (if in fact it did)? [p. 63]. • "The Kingdom of Minyas (Minni) disappeared from history at the beginning of the sixth century BC, since its last historical mention is in Jeremiah 51:27. • Noting that Mt. Ararat is called Masis by the Armenians, Movsisyan observed: “In cuneiform syllabary there was a good deal of ambiguity, and the symbol or the syllable bar could also be read mas… in translating the cuneiform into Greek, if the scribe did not know the exact name of the mountain, it could have been misread, as a result of which the Greek translation of the mountain’s name appeared in different variants” (emphasis added). The simplest possible forms of the two words—the ones favored by the principle of parsimony (the simplest explanation is most likely true)—are in each case option “a.” There is no way for most people to tell them apart; from Labat’s illustrations, it appears the only difference may be a subtle lengthening of the cross stoke in the bar character relative to that in mas. The only way for a Greek translator to reliably choose between the two would be to know of the existence of the Armenian name Masis. Being a proper name, grammatical context alone would have been no help in differentiating the two options, and the inside knowledge to make the correct choice could have been hard for a foreign translator to come by. An outsider who had never heard of Masis would have no cause to prefer it over Baris, so his choice would be a toss-up. And it looks very much like Nicolaus of Damascus, or another unknown person who made the Greek translation he worked from, made the wrong choice. Well, that was really helpful information! It appeared to me that Movsisyan had finally cleared up the Baris mystery. His theory, that the essentially identical cuneiform symbols for Bar-is and Mas-is resulted in an error translating into Greek that got passed along by Nicolaus and duplicated in Josephus, made far more sense than the definition-based arguments given by Bailey and Murad. 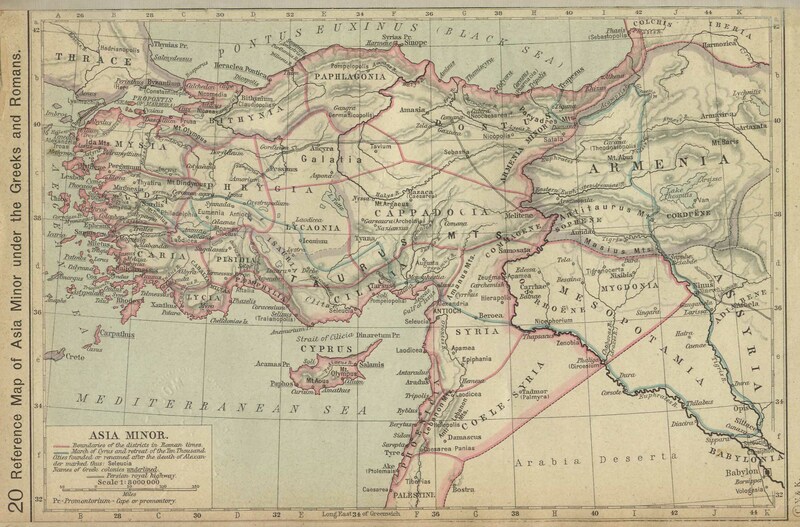 It also meant that Shepherd had been correct in identifying Baris with Mount Ararat on his map, in agreement with Nicolaus’ locating his “great mountain” north of Minyas. The pieces of the puzzle all fit together at last. Though the main mystery was resolved to my satisfaction, I still wanted to tighten up certain secondary details in Movsisyan’s analysis. One was that the last known historical mention of Minyas, in Jeremiah 51:27 (“...summon against her the kingdoms of Ararat, Minni and Ashkenaz...”), allows one to say the Kingdom of Minyas disappeared from history in the early sixth century BC (Jeremiah died in Egypt in 585 BC). That struck me as a weak argument from silence; since the Bible is selective in the things it reports, there remained a real possibility that Minni could have continued to exist for some time after its mention in Jeremiah—perhaps even into the time of Berossus, invalidating the claim that Baris predated Berossus’ information. Another matter was Movsisyan’s apparent assumption that foreigners were involved in rendering the original material into cuneiform, prompting his suggestion that the Masis tradition was known at an early time outside of Armenia, and was written down in some ancient center of cuneiform writing. This was conjectural, because he did not rule out the possibility that the cuneiform record was actually created in-house, so to speak, by native Urartians skilled at cuneiform. Finally, he suggested that in the Hellenistic period, the cuneiform record was translated into Greek, at which time the ambiguous symbols Mas-is were interpreted as Bar-is, and it was this corrupted form that came into the hands of Nicholas of Damascus. Fair enough; but what about the possibility that Nicolaus himself had made the translation and goofed? Movsisyan did not raise that issue, which was to my mind just as likely, particularly for someone scholarly enough to pull together a Universal History from diverse sources like Nicolaus did. I first turned my attention to the timing of the bar/mas confusion. The duration of the Mannaean kingdom’s existence provides a time limit for Nicolaus’ information, because his cuneiform source writes of Minyas in the present tense—the Mannaean kingdom was still in existence when the record was written. It’s a bit hard to nail down a precise date, though. The Zoroastrian Heritage website (off-site link) claims Mannae became part of the Median Empire in 594 BC. Wikipedia says it was annexed by the Medes in about 609 BC. These references both indicate that Movsisyan’s use of the last known historical mention of Minyas, Jeremiah 51:27, as his basis for saying the Kingdom of Minyas disappeared from history in the early sixth century BC, yielded a safe ballpark figure. Textual considerations, which we will look at next, are also consistent with this conclusion. Moreover, the Baris site predated all of the Islamic sources cited to tie the landing-place to Mount Cudi. It existed prior to the Christianized Armenians transfer of the Mount Cudi tradition to Mount Ararat, a mystery in itself. Taken together, this is powerful evidence that the historical tradition that apparently points to Mount Cudi as the Ark site is not so much wrong, as it is incomplete. It does not go back far enough. It is the conclusions drawn from this incomplete historical record that are in error. My study hinges on whether certain characters in Urartian cuneiform from the ninth-sixth centuries B.C. were morphologically identical to earlier Akkadian cuneiform, such as that illustrated in Rykle Borger’s syllabary of ancient Akkadian, Mesopotamisches Zeichenlexikon (2004)...I have been reading your book, Ancient Ararat: A Handbook of Urartian Studies. In it you stated, on page 103, that “Although there are more than six hundred standard cuneiform signs, the Urartians only used about 155.” Here, then, is my question: Would the restricted Urartian cuneiform character set include Borger’s MesZL Akkadian cuneiform characters 120, 121, 122 [the cross-like symbol in Labat, shown above]? (Per Rykle Borger’s list of Akkadian symbols at www.sumerisches-glossar.de/download/SignListNeoAssyrian.pdf; they correspond to the syllables bar and mas.) I have not been able to find a specifically Urartian syllabary, and would be very grateful if you can clarify this. Thank you so much for any assistance you can offer me in solving this vexing question. There is an easy answer to your question, and I will try to get it to you soon. Mirjo Salvini has recently published the 4th Volume of his definitive Copus dei Testi Urartei, and it contains as comprehensive an Urartian sign list as you could ask for—drawings and photos of every sign form on clay and stone. I know that the Urartians used the maš, bar/par sign, which also stands for 1/2, but am not sure which readings they actually employed. Of course, it might not matter for your argument whether or not they actually pronounced it maš, for example—you only need someone to later misread it that way. In any case, I will send you a copy of the relevant entry in Salvini as soon as I can get back to the library—that may be a few days because things are pretty busy in my life these days. As I write this I have not yet received a copy of Salvini’s study, but this reply from a true expert could not have been more encouraging! It meant that the Armenians themselves, who best knew their Ark tradition centered on Masis, could certainly have created their own cuneiform record without the Akkadians being involved. Darius I [522–486 BCE] claims credit for the invention of Old Persian Cuneiform in an inscription on a cliff at Behistun in south-west Iran. The inscription dates from 520 BCE and is in three languages—Elamite, Babylonian and Old Persian. Some scholars are sceptical [sic] about Darius’ claims, others take them seriously, although they think that Darius probably commissioned his scribes to create the alphabet, rather than inventing it himself...Old Persian [was] the language used in the cuneiform inscriptions of [the] Achaemenian dynasty and the vernacular of the Achaemenian elite. It also explained that, unlike the exclusively syllabic nature of Akkadian and Urartian cuneiform, Old Persian was both phonemic and syllabic. As can be seen, there is no equivalent for the ambiguous bar/mas character (per Borger’s and Labat’s cuneiform syllabaries) shared by Akkadian and Urartian cuneiform. Under Persian rule, the Urartian language—related to Hurrian—was replaced by Armenian, which was the tongue of the common people. Probably, this was not caused by ethnic, but by political changes: when the Persians had conquered the country, they favored the latter language, which is related to Greek and—at a distance—Persian [www.livius.org/arl-arz/armenia/armenia.html, off-site link]. This allows us to say with considerable confidence that the original cuneiform records mentioning Masis probably originated from native Urartian sources which KNEW the Masis traditions, and that these sources ceased to exist near the close of the sixth century BC. This is consistent with the dating information derived from the demise of Mannae. I believe we can now pronounce the Baris mystery solved. Movsisyan identified the key, which was recognizing that a confusion of virtually identical cuneiform characters caused Nicolaus of Damascus to write “Baris” instead of “Masis.” If we plug “Masis” into Josephus’ citation from Nicolaus, it fits the other details perfectly: Masis—Mount Ararat—is indeed a great mountain, both massive and tall; it is a singular peak, standing in awesome majesty by itself, rising out of the plain set apart from the rest of the mountainous territory that surrounds it; and it is “above Minyas,” north and slightly west of the territory that was formerly the home of the Mannaens. Because he included it in the same paragraph of Antiquities where he quoted Berossus, Josephus obviously thought the two citations did not contradict one another, and in his mind, “at the mountain of the Cordyaeans” agreed with Nicolaus’ stipulation that the proper mountain was north of Mannae. Josephus had more confidence in the location and name details recorded by Nicolaus than in what Berossus derived from the Babylonian Flood Myth, so he used those to build his case. We should do the same. And we should not overlook the simple fact that there is no record of Mount Cudi ever being known as Baris, either. In closing, I want to emphasize that this information was not gathered together overnight. It was a very slow process spanning several years. Reflecting back on this journey of discovery as I wrote this article, I marvel at how the Lord caused different pieces of information to gradually come to my attention over time, one thing leading to another, a contact here resulting in another contact there, that finally allowed the mystery of Baris to be cleared up—to my satisfaction, at any rate. I hope it also satisfies the majority of those who read this account. I fully understand the draw of the historical case centered around Mount Cudi that causes some to label it “compelling,” but think that the “mysteries” that still plague it reveal some fundamental underlying problems with the theory that cannot be dismissed. If we allow Mount Ararat to correspond with Baris, we can set one of those mysteries aside. Your article revives a line of thought that has crossed my mind on several occasions. I refer to the multiple ancient historical references to the trade of bitumin amulets associated with the ancient relics of Noah's Ark. Since wood is perishable and we may well be dealing with an historical tradtion for Ark remains that could be 2500 years old or even older, my question is...is the place to look for the remains of Noah's ark in disbursed bitumen amulets? I further wonder whether an amulet associated with an important ancient ritual site such as the wrecked remains of an ancient vessel, would it not be likely that some of the amulets would reference the site in their form? I'm an artist not an archeologist but if I were creating an amulet associated to Noah's ark, I would artfully shape its form to reference a boat or an ark. Is their a tradition of such amulets? In a modern sense think of all the trinkets in the shape of La Tour Eiffel you can find pick up on a visit to this Parisian attraction. Would the ancients be that much different from us? If such remains existed in the ancient world as we find mentioned in several ancient historical accounts I would excpect to find boat or ark shaped bitumin amulets. And perhaps such amulets may be the only remains of an ancient wooden vessel given the revages of time. I appreciate your work here. It raises some interesting questions. There was one part, however, where I had trouble following your argument. You say, “Nicolaus’ Baris was considered the landing-place of the Ark approximately four centuries prior to Berossus…Baris thus has claim to the greatest antiquity of ANY named site for the Ark’s landing-place.” I do not see how you arrived at this conclusion. Could you enlighten me, please? A few more thoughts. From the Bible we have descriptive places names like Gibea, Geba, Ramah, Mitzpeh, Hazor, etc. From Urartu, we have descriptive place names like Rusahinili Eidurukai (“Foundation of Rusa in front of Mount Eiduru”). Is there any reason Baris cannot be descriptive? Do we have any attested writings of Masis or Baris in cuneiform? I am wondering how we can be confident that *cuneiform confusion* explains the name Baris. I do not believe the “principle of parsimony” properly applies to cuneiform writing, and if we do not have attestations of Masis in cuneiform, then we cannot say how the name was or was not written. Also, the map of Urartu is not entirely accurate. The map appears to be trying to show Urartu at its greatest extent, which would really only apply to about the first half of the 8th century B.C.